Iberian black pork shoulder is a thinly sliced by hand ham, placed in easy opening vacuum bags easy of about 100 grams. 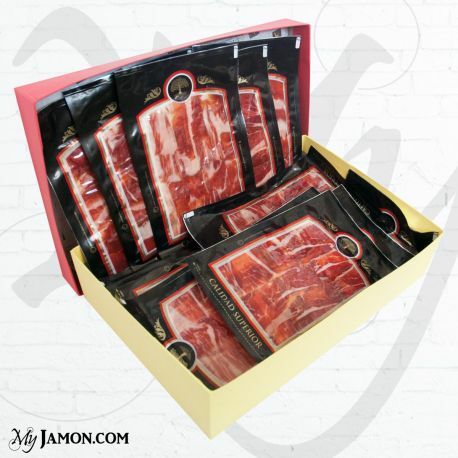 Why complicate and giving up the best Spanish flavors when you can surprise your guests with the extraordinary quality of the Pata Negra ham! Presented in a box which reminds the Spanish colors, the Iberian ham cut by hand by a professional and vacuum packed in easy bags, will be your original gift for any occasion. Once you order we will select one of our best pieces of around 5 kg and you will get it home in a few days ready to open and serve it!